Growing up in a working-class family, we never had a garbage disposal at our house. I remember a few friends had them in their homes, but we didn’t have the money to install one. The place that we lived in was too old to have it already included, so we just lived without it. Then, when I was in college and got my first apartment, it had a garbage disposal under the kitchen sink. I recall just how I felt seeing it was there. It was like I was finally up with the times. I don’t enjoy doing the dishes all that much to begin with, but to clean out all the nasty and wet food after all the water goes down is even worse. Those few years in my twenties that garbage disposal definitely got a workout I can tell you that much is for certain. A few years ago, my wife and I bought our first home together. We were so excited to find the perfect home in the best location at a price we could afford. After staying there for a few weeks and settling into a routine, we realized that we didn’t have a garbage disposal under our kitchen sink. There was no way that we were going to live without one after having one for so long. After doing some research, we settled on buying the Emerson E202 to install. Let me share with you what I’ve discovered about the unit since we’ve had it put in. I discovered that this is one powerful garbage disposal the very first time that I plugged it in. The Emerson E202 has a ½ horsepower motor, but it’s a quiet one with the Dura-Drive induction motor that they used. I could tell right away that it was heavy-duty because of the galvanized steel that it was made from. 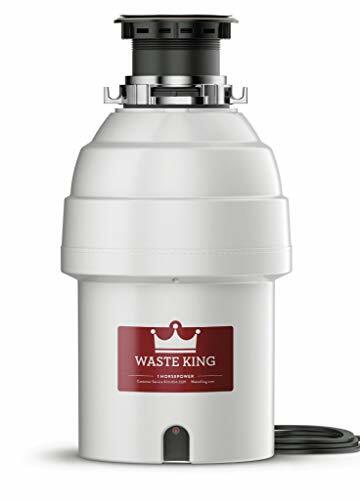 I was worried about getting a giant garbage disposal shipped to us after I ordered it because that’s what I had in my apartment. To be honest, I didn’t think about the smaller kitchen sink that we had at our new house or taking any measurements until the day that it arrived. Thankfully the Emerson E202 garbage disposal is compact and fits perfectly in the smaller spot. That doesn’t mean that it doesn’t have to ability to hold up to everything we run through the 26-ounce grind chamber though. I’ve put some pretty serious stuff down this thing, and it always chops it right up without any sort of problems. 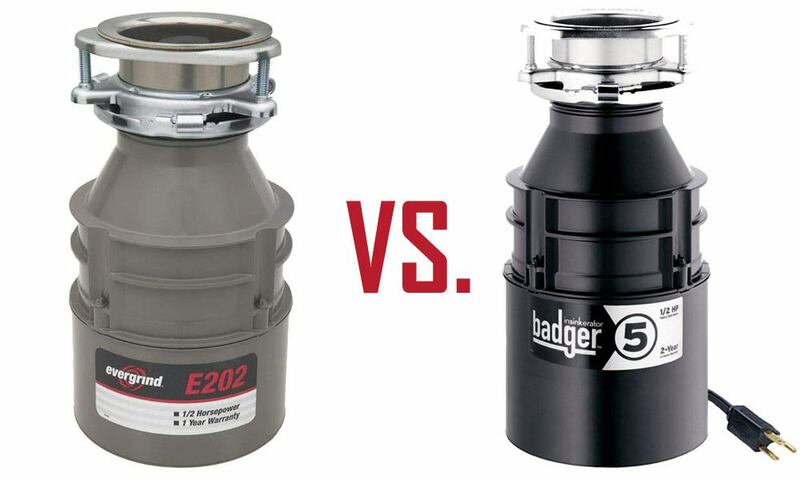 The InSinkErator Badger 5 is about as close in price as I could find to the Emerson E202. They both have the ½ horsepower motor as well. Other features are similar with a 26-ounce grinder chamber and a composition of galvanized steel. The InSinkErator doesn’t include a power cord either, so that’s just like the Emerson E202 that I decided to go with after making the comparison. 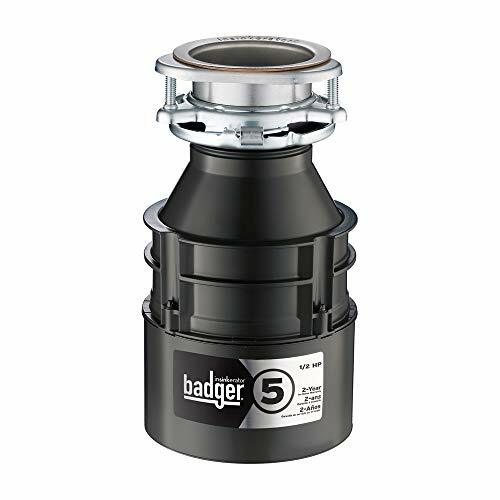 They offer a 2-year “we come to you” warranty on the InSinkErator that looked appealing, but I decided on the Emerson after reading some other reviews about the Badger 5 not lasting more than a few months. There were lots of complaints about it leaking after just a short time. There were even some customers that had reported a fire hazard risk that was present on their units, and they were responsible for getting the problem fixed. The company didn’t pay for the repair. 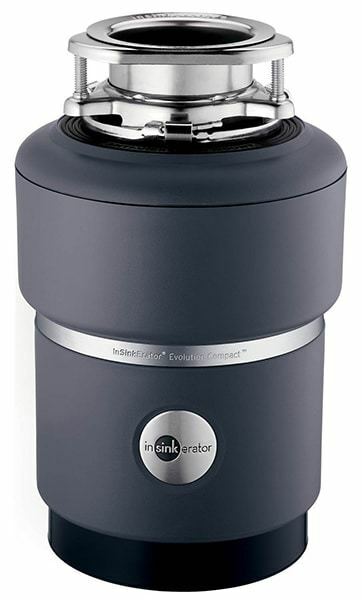 There were just too many red flags that popped up for me when reviewing the InSinkErator. 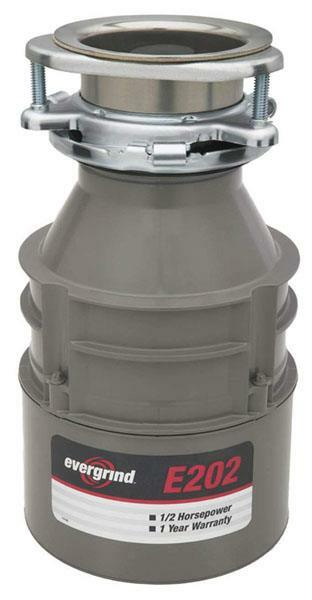 The Emerson E202 garbage disposal seemed like it was a little easier to install and like it would last a lot longer. So far, it has done precisely what we’ve expected out of it. As a new homeowner, I wasn’t really sure what I was getting myself into when it came time to install a garbage disposal under our kitchen sink. All that I knew was that my wife and I wanted one. I think I got pretty lucky with the Emerson E202. One of the things that first drew me to the model was the reasonable price tag. We didn’t have a lot of extra money in the budget those years ago when we purchased this, so I wanted something that wouldn’t break the bank, but would still do the job we needed it to. After checking out some reviews and seeing what other customers were saying about the Emerson brand, I was pleased to see that several of them have had their units for many years. That’s exactly what I was looking for. I didn’t want to have to be replacing my garbage disposal every couple of years. Even with an easy installation like this one, nobody wants to be climbing under their kitchen sink all the time to swap out disposals. The ruggedness of the disposal was nice, and I could tell that it was going to withstand all that we put it through as soon as I took it out of the box. It was made from stainless steel that I figured would last without leaking, and so far things are looking pretty good under there. The compact size was ideal as well as our cupboard under our kitchen sink isn’t all that great in size. My wife likes to store her cleaning supplies and such under there, so if we had a bulky garbage disposal, it would take up too much room. Even with the small size, it still does the job that I need it to when it comes to grinding down even some of the toughest textured foods. There is no way that I would put chicken bones or anything down it with only a ½ horsepower motor, but I would rather have a smaller and quieter motor and just throw stuff like that in the real garbage can. The biggest issue with the Emerson E202 garbage disposal is the fact that it doesn’t come with a power cord. I checked to see what other people were doing about that and because they were generally replacing an older model, they just switched the cables out. I was doing a new installation, so that wasn’t something that was an option for me. I took the disposal to the hardware store though, and they took care of it for me pretty quickly, and it wasn’t a substantial additional expense. After getting that accomplished, it was easy to get the disposal in and start using it right away, so I consider it a mission accomplished.